Paramedic Cory Rabe leads the REMSA class that teaches bystanders techniques to stop life-threatening bleeding in the event of an emergency. Last year, there were 340 mass shootings nationwide. That’s according to the nonprofit the Gun Violence Archive. Mass casualty events can cause mayhem, delaying first responders from getting to the scene quickly. KUNR’s Anh Gray visited a training session for a national campaign called Stop the Bleed, which empowers bystanders to render aid. A note of caution: The topic we are about to explore may not be suitable for children. A paramedic is preparing a group of about twenty students for a hands-on class that can get intense. 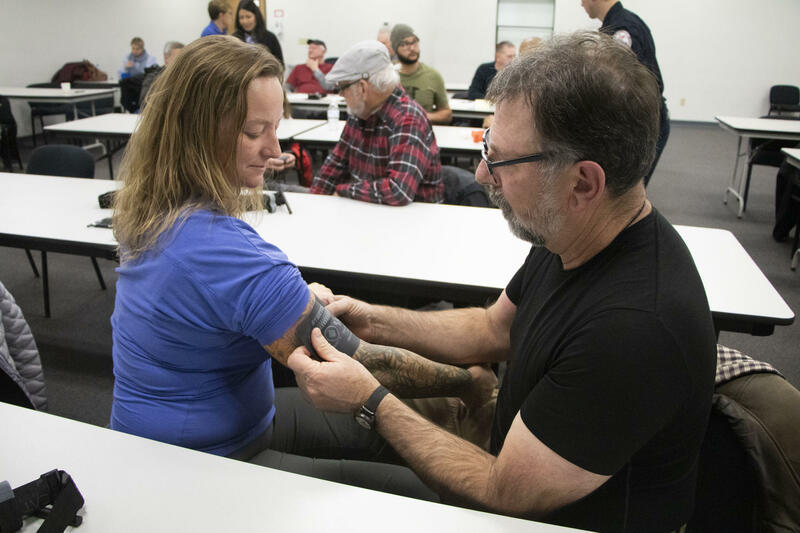 It’s organized by Northern Nevada’s ambulatory service provider, the Regional Emergency Medical Services Authority, or REMSA. Avery Baldwin is a paramedic with REMSA and coordinates the agency’s local Stop the Bleed program. He says the loss of life from severe bleeding happens in mere minutes and is the most preventable cause of death from trauma. The deadliest mass shooting in modern U.S. history took place in Las Vegas in 2017. The gunman killed 58 people and wounded hundreds more. It’s been reported that the death toll would have been even higher, but some bystanders provided lifesaving aid. Typical of other incidences, after the tragedy, the Stop the Bleed program in Vegas saw a spike in people signing up. 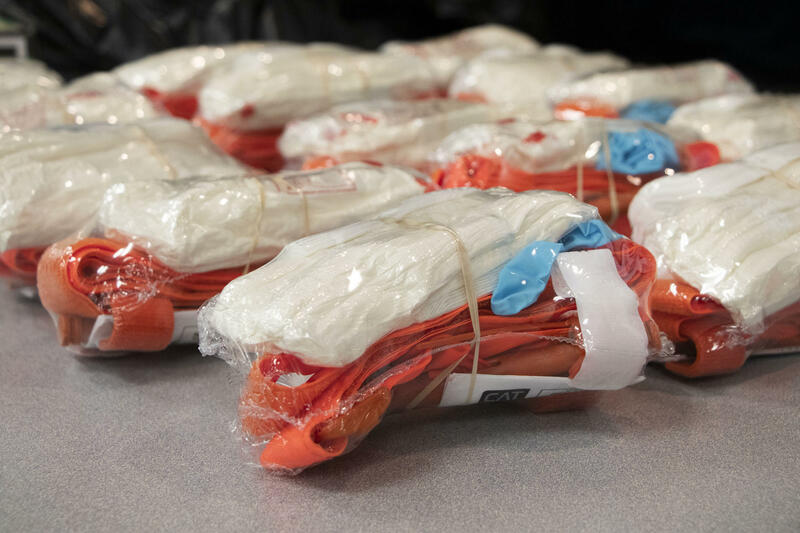 Since the inception of the program, according to Stop the Bleed, more than 500,000 people have received this training nationwide, and about 13,000 are Nevadans. A class instructor demonstrates one of the techniques learned in REMSA's Stop the Bleed class: applying pressure to a wound. In a class lasting about two hours, Paramedic Cory Rabe is teaching participants how to recognize who needs help. Students practice using several types of tourniquets, including one called the CAT—the Combat Application Tourniquet—designed for military use. Rabe tells them a common mistake is tying a tourniquet too loosely. “You want to pull it as tight as you can, and then you’re going to secure it," he told a student. Then he makes the rounds around the class to make sure students get to experience how tight it needs to feel by having it tied on them and having someone tie it on him. Today’s class is a mix of people who are here for various reasons. Joey Walker is a retired officer from the Reno Police Department. He was with the agency for 25 years and now teaches active shooter defense to businesses and individuals. J. Brandon practices a technique on Val Weston during REMSA's Stop the Bleed class. As for partners Val Weston and J. Brandon, they’re here because they’re outdoor enthusiasts and motorcyclists. A few months later, the American College of Surgeons—a group of more than 80,000 surgeons worldwide—formed the Hartford Consensus under the guidance of Jacobs. Their work led to the creation of Stop the Bleed, which has adapted military protocols for treating injuries. Class participants are given bleed control kits at the end of the class. Stop the Bleed is working to make similar kits more readily available in homes and public spaces like schools, malls and sport arenas. The kits include tourniquets and wound dressings approved by the Department of Defense. Jacobs says that, similar to CPR training, having bleeding control skills can help save lives. “I felt really strongly that we had to do something that will make a difference in the future,” Jacobs said. Gun violence has become a normalized occurrence in American life. In 2017, nearly 40,000 people were killed by firearms. That’s according to data from the Centers for Disease Control and Prevention. The Stop the Bleed campaign is attempting to build national resilience to that reality by empowering more people to step in when emergencies strike. Disaster planning often focuses on treating adults and overlooks the special needs of children. KUNR’s Anh Gray reports as more communities nationwide experience gun violence, emergency workers are learning how to care for young victims of mass shootings. October 1 marks the first anniversary of the mass shooting in Las Vegas, the deadliest in American history. Many Northern Nevadans were there and have spent the last year feeling the effects of that tragic night. Kristine Richter and her husband were at the Route 91 Harvest Festival for her birthday when celebration turned to horror. She talked with KUNR's Holly Hutchings about surviving that night and learning to live in its aftermath. KUNR's Anh Gray talked to the president and CEO of Renown Health, Dr. Tony Slonim, about why he and other medical professionals are speaking out. A federal grant for more than $650,000 is meant to help Northern Nevada law enforcement agencies prevent firearm-related crimes. KUNR’s Anh Gray talked with Detective Lieutenant Zach Thew with the Reno Police Department about the Reno Gun Initiative, which launched last year.